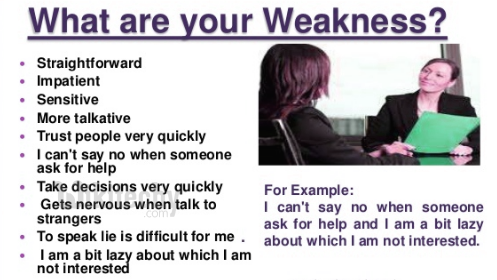 What are your Strengths and Weaknesses ? Home HR Interview Questions and Answers What are your Strengths and Weaknesses ? Your answer must be true. Relevant to the position applied for. Ultimately what you’re aiming to do is to reassure the hiring manager that you’re the right person for the job. You want to make sure your answer shows them that your strengths are in line with what the company needs and is looking for. You need to let them know that you are fully capable of doing the job you’re being hired to perform and that you are the perfect person. Are we honest in answering. To ensure whether we have the capability to correct things. Do they take any risks hiring you? Avoid deal-breakers for the job. Remember that a weakness isn’t necessarily bad. In my last position, I wasn't able to develop my public-speaking skills. I'd really like to be able to work in a place that will help me get better at giving presentations and talking in front of others. Sometimes I'm little bit lazy, believing every one which is not true in all case. I can't say No directly if someone asks me for help. Also, I think I'm not at all a highly talkative person. Sometimes it is my strength too. But I am improving to overcome it. Related Searches to What are your Strengths and Weaknesses ?